Few experiences can match the pleasure of savoring homegrown vegetables. The flavor and number of varieties that you can grow far exceed what you can buy at a grocery store. 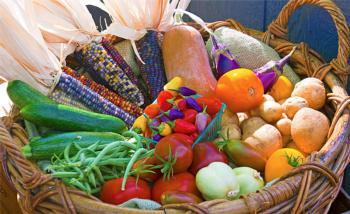 Growing vegetables does not have to be time consuming or difficult. Many vegetables can be grown successfully in containers on patios and rooftops. Experience really is the best teacher, and as your gardening knowledge increases, so will the rewards. When you grow your own food, you know where it came from and exactly how it was grown. If you are concerned about the use of chemical-based fertilizers and pesticides, you have control over the fertilizers and soil amendments used to make your crops flourish as well as what you use to fight pests and diseases. Also, you will know that your vegetables are as fresh as possible. Below is a collection of resources just for the home gardener. For details on the vegetable garden at the Fair Oaks Horticulture Center, visit the link in the gold bar above. Vegetable demonstration garden at the Fair Oaks Horticulture Center. UC IPM - UC Integrated Pest Management, the University of California's official guidelines for managing pests with environmentally sound methods. Plant problem diagnostic tool - UC IPM gives you the ability to solve plant problems. Managing pests in the vegetable garden from UC IPM gives cultural tips and guidance for dealing with pests and disorders of more than 20 commonly grown vegetables. Managing weeds in the vegetable garden from the UC IPM program. UC publications catalog - UC Agriculture and Natural Resources offers many free, downloadable publications on gardening topics. The California Garden Web answers frequently asked questions about planning, planting, caring for, and harvesting vegetables from the California Garden Web. Also includes specifics about more than 30 vegetables. Vegetable Growing Guides from Cornell University. Get Growing! with Farmer Fred - Fred Hoffman, Lifetime Master Gardener and host of KFBK Garden Show (1530) and "Get Growing" (KSTE, 650). Monthly tips to help you get the best from your vegetable garden. Vegetable Problems in Summer will help you diagnose problems in your victory garden. Grow your own vegetables (PDF 78kb) tip sheet covers the basics of home vegetable gardening including planting requirements, when and how much to plant. Cover cropping (PDF) in home vegetable gardens explains how and why to plant a cover crop to improve soil quality and nutrition. Soil solarization for gardens and landscapes using the heat of the sun to manage soilborne pests from the UC IPM program. Soil solarization research project (PDF 292kb) was conducted in a Sacramento County strawberry field. Crop Rotation lists the top ten vegetable families and their members to help vegetable gardeners plan a crop rotation schedule. Beets gives information about beets, including planting, care, pest problems and harvesting. Carrots provides information about carrot cultural requirements, varieties grown, results, and tasting comments from a demonstration at the Fair Oaks Horticulture Center in 2007-2008. Growing Lettuce in Warm Weather gives you suggested varieties and cultural tips. Melon demonstration describes melon cultural requirements, varieties grown, results, and tasting comments from a demonstration at the Fair Oaks Horticulture Center in 2007. Mycorrhizae Test on Melons was performed to see if adding the fungi to plant roots would improve growth and yield. Sweet Potatoes (PDF) in Sacramento gives information for growing sweet potatoes including growing slips, planting, caring for, harvesting and storing them. Sweet potato experiment describes the growing experiment conducted at the Fair Oaks Horticulture Center in 2013. Building healthy soil - Healthy soil builds healthy plants, and saves water to! Manage garden pests by watching short instructional videos from UC IPM.